I'm determined to scrap our epic East Coast trip from last October before our upcoming epic Midwest trip this summer. I've already shared New Jersey. Today, Delaware. 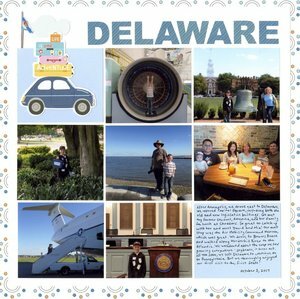 Of the four states we visited, we spent the least time in Delaware and thus did the fewest things. Despite that, it was still a challenge to limit myself to just 7 photos representing all the fun places we went. Actually, there are 8 photos, if you count the state flag that I fussy-cut and added at the top left! I love how the page turned out. I'm giving myself six weeks to finish up pages for Maryland and Pennsylvania, the two states where we spent the most time and covered the broadest range of activities. Narrowing down those photos is going to be a major challenge. Wish me luck! Loveeeeeeeee this! LOVING the car!! My fave part of Delaware is the tax free shopping! LOL!!!! And good luck with the other states!!! !